This site is dedicated to collectors of UNIPART, MULTIPART, and other Porcelain Insulators.
. If you have question, please feel free to email me by clicking on the Letter Box below. I will try to answer any of your questions about porcelain insulators. The book is 278 page book is spiral bound so it will lay flat when opened. The size is 8-1/2 x 11. The book is available NOW! For those of you not familiar with the porcelain Value Guide, the bulk of the iconic photo-illustrations of each U-number style are NOT in the Value Guide. You will need the new 2015 Guide Book ($49 plus $5 shipping). The bulk of the M-number styles for cemented multipart styles are NOT in the Value Guide. 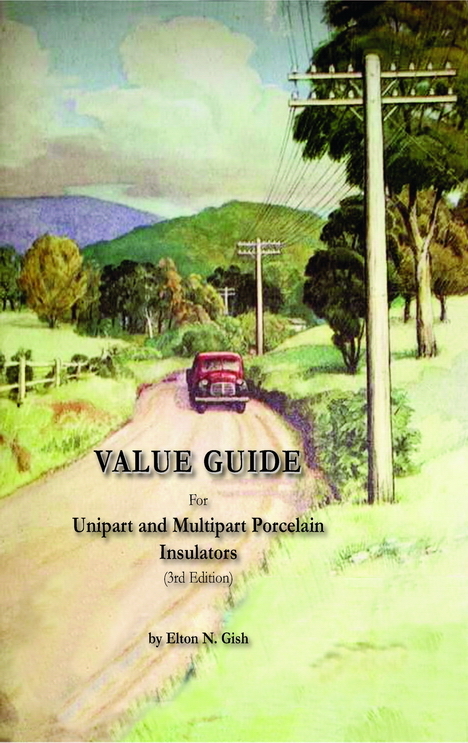 You will need the book Multipart Porcelain Insulators ($25 ppd). All books may be order on this web site (www.r-infinity.com/Books_Porcelain_Insulators.htm) or send personal check or money order to the above mailing address. 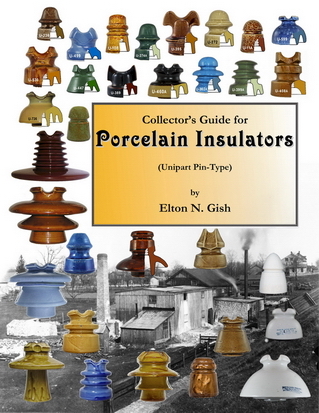 Do you need reference Books About Porcelain Insulators ??? NEW Unipart Profile Categories: U-Chart is separated by styles such as "pony", "exchange", "pogo", Mickey Mouse", "signal", etc. Odd Numbers and Letters found on Fred Locke porcelain insulators. Fred Locke's Attic: The latest photos of the insulators Jeff Katchko and Ken Willick have dug up. Fred Locke Updated photos of rare insulators. Kern-1 Line (1907) M-4800 insulators made by Victor (Locke), Thomas, and New Lexington. View the story and details of this incredible find by Carver Mead and Barbara Smith!!! Locke Duncan Suspension - This is a link to an article by Carver Mead. Here is a link to the full Duncan patent. Remnants of the Southern Power Co. Part 2 - Another excellent article written by Carver Mead and Barbara Smith that appeared in the Spring 2004 issue of Power Line Explorer Journal. It is about their hunt for the very rare 14" diameter Thomas 2-part suspension insulator. The 12th (---) of Christmas - Another excellent article written by Carver Mead and Barbara Smith that appeared in the April 2004 issue of Crown Jewels. It is about their hunt for the 12" diameter flat Thomas suspension insulator. The title of their article has several meanings. Hewlett Suspension Disc Insulators - Learn how the Hewlett suspension and fish-tail insulator was developed and see some strange and rare suspension insulators. Hewlett Suspension Disc handwritten markings - Unusual handwritten markings scratched typically on the underside of the disk. Updated Porcelain Wiring Cleats - Brief history of cleats including rate wooden cleats and an extensive listing with photos of known porcelain cleats. 1-Wire Cleats - 1-wire cleats are heavy duty industrial cleats for conductors with insulated covering. Specialty Porcelain - Telephone styles and special designs not covered in Standard Porcelain or any of the other categories. Forestry Insulators - Brief history of forestry insulators and extensive listing with photos of known insulators. Glazed Wall Tubes - A comprehensive study of the older glazed tubes that are over 90 years old. Insulator Manufacturer's and Markings: List of company markings found on porcelain insulators. Fred M. Locke web site: Dedicate to just porcelain and glass insulators made and sold by Fred Locke. It also includes Lima Insulator Co., recent hunts and finds, advertisements, patents, family and factory history, and much more. You can spend thousands of hours reading, searching, and researching your favorite insulator, manufacturer, etc. The Insulator Gazette at: http://reference.insulators.info/publications/ This is a searchable database of over 13,000 articles from hundreds of newspapers and trade journals published since 1850. The content is all about insulators in some way. The people involved, the companies involved and the insulators and how they were manufactured, tested and used. You can spend hundreds of hours reading, searching, and researching your favorite insulator, manufacturer, etc. Insulator Patent Library at: http://reference.insulators.info/patents/ There are more than 3,000 patents relating to insulators of all kinds including design patents. Postcards of Locke Insulator Co.
Lapp Museum at LeRoy, NY (May 1993) When I was doing research for the Fred Locke book, I went to Victor, NY in May 1993. Part of the trip was to the Lapp factory in LeRoy, NY with the sole purpose to visit the Lapp Museum, which was set up by Brent Mills. Click on the link to see the photos of the museum. Pittsburg Date Markings Very few porcelain insulator made by Pittsburg High Voltage Insulator Co. were marked with the name PITTSBURG. However, many insulators were marked with manufacturing dates and various date control markings. Click on the link above to see the current listing of these types of markings. If you have any that are not on the list, please contact me using the email link at the top of this page or send you reports to the address shown in the book section below. 3. Electric Porcelain & Mfg. Co.
5. R. Thomas & Sons, Lima Insulator Co.
6. Macomb, Square D, and Peru Electric Mfg. Co.
7. New Lexington High Voltage Insulator Co.
Insulator Research Service: If you have an insulator you would like to learn more about, please feel free to contact the Insulator Research Service (go to www.insulators.info/irs). I can send you links to make your own Patent copies. The IRS is a good resource if you are designing an insulator display and would like additional research or copies of advertisements (over 1200), trade journal articles (over 1000) and patents (over 2800). No fees are charged if you are building a display or doing research for future article. Please be aware that no patents were granted for threadless insulators and very few specific insulator CD styles. Click on the IRS link above to see a nearly complete list of CD styles covered by patents or click on this link to go to the patent database: Insulator Patents and do your own searching. The IRS has copies of more than 2800 insulator related patents which includes more than 300 patents dealing with Lightning Rods: Points, Insulators, Ornaments (lightning rod balls), Conductors, and Rod Supports.